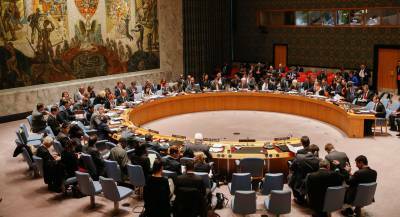 UN Security Council Resolution Tabled by Russia: The Creation of an Anti-ISIS Coalition “Authorizing All Necessary Measures” Against The Islamic State, Will the US Comply? World powers are poised to forge a single resolution at the United Nations Security Council to declare a common war against Isis and “eradicate” jihadists in Iraq and Syria, The Independent understands. The attacks in Paris as well as the downing of the Russian jet over the Sinai Peninsula have galvanised a hitherto divided Security Council. And a new reality exists: with its alleged execution this week of a Chinese national, Isis has now slaughtered citizens of all five permanent Security Council members. French officials said they were formally submitting a draft resolution to the Security Council, pushing aside a competing draft offered by Russia earlier this week. It could be adopted as early as Friday or over the weekend. The French manoeuvre reflected confidence that its resolution would not provoke Russian or Chinese vetoes and would thus win approval. The text, shared with the The Independent, calls on member states “with the capacity to do so” to “take all necessary measures, in compliance with international law, in particular international human rights, refugee and humanitarian law, on the territory under the control of Isil [Isis] in Syria and Iraq, to redouble and co-ordinate their efforts to prevent and suppress terrorist acts committed specifically by Isil… and to eradicate the safe haven they have established in Iraq and Syria”. We are in favor of any international, multilateral effort to erradicate psychos with guns. But if this resolution passes, will the U.S. stop “accidentally” delivering weapons to ISIS? Curious minds want to know.